The sculpture at the heart of the Cheshire Gardens Trust Silver Medal winning garden Time and Tide at RHS Tatton Show 2012 by artist Christine Wilcox-Baker has found a leafy new home outside the Knutsford Council Offices on Toft Road. 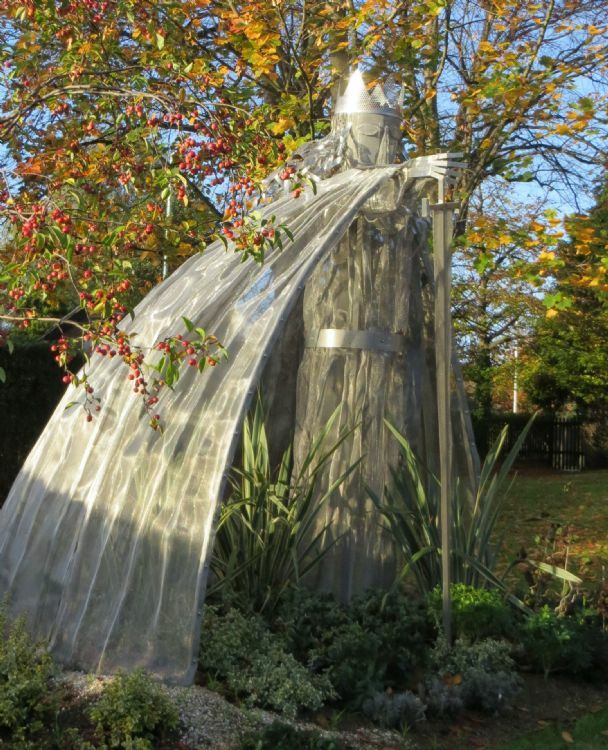 The piece, constructed from stainless steel meshes and perforated sheets, was inspired by the logo of Caldwell Nursery, which traded in Knutsford for over 200 years and is the subject of detailed research instigated by the Cheshire Gardens Trust. CGT constructed the Time and Tide garden, designed by landscape architect and CGT member Jacquetta Menzies, to promote the Caldwell Project and attract members of the public who could contribute to the Caldwell Oral History. Click here for more images of the prize winning garden in our Gallery. And click here for more information and a link to the Caldwell Project Website where you can also listen to the Oral History recordings.